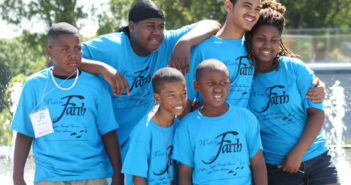 Often families get closer, and need one another more for solace, in hard times. Reunions are really the time that, no matter what, you get together to reassure one another and perhaps find ways that will foster the interdependence that typified families until not too many decades ago. Our surveys about reunions in hard times lean very strongly in the direction of finding ways around things you’ve come to expect at every reunion. At least the banquets you enjoyed in the past, if they’re hard to afford now, can be what you look forward to enjoying again when the time is right and the money more available. We asked readers for ideas for reunions to survive and thrive in hard economic times and how they save money and still have a fun time. 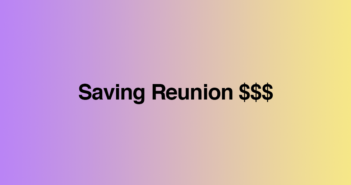 We identified reunions, which, responding to a survey, indicated they spend less than $1000 on their reunions, and specifically asked them to share the ways they save and how they raise money for their reunions. Overall you are seeking value for your reunion buck. No need to sacrifice the “bang” to spare the budget. Creativity helps you wow the crowd whether you spend a lot or a lot less. Promote ownership of the reunion by marshalling the skills and talents of reunion members instead of paying for services. This could include grandma doing phone calls or teenagers maintaining a web site, others organizing fundraising activities to help pay reunion expenses or raise money for scholarships for family members. Contact the local convention and visitors bureau to learn about their free services including collecting quotes from venues according to your specifications. Often times the travel industry is in a buyers’ market and hotels, resorts and other venues are dealing for long range business. Start early, lock up the place you really want at a better than usual price. Look at less pricey alternate venues such as vacation homes or condos that often have four or five bedrooms to accommodate more people than hotel rooms. 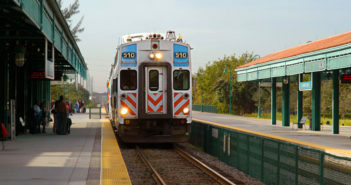 They include cooking facilities, are usually close to attractions and activities, and often have pools, hot tubs and free parking. No matter where you hold your reunion, look for activities, attractions, festivals and fairs that charge no admission or have group rates or free times/days. Use email, social media and web pages for communication. Design web pages so they can be printed and mailed to the few members who are not online. You can virtually eliminate the high cost of paper, envelopes, printing, and postage. Have and post on a Facebook page and send twitter alerts; hashtag (#) your reunion name. Lower food costs by cooking your own meals or engaging a caterer instead of having a banquet or better yet, potluck instead of catering. Potluck is an opportunity for family cooks to show off their own and some of grandma’s specialties. Ask everyone to bring the recipes on cards to share or email recipes for a souvenir booklet to hand out as a reunion memento. 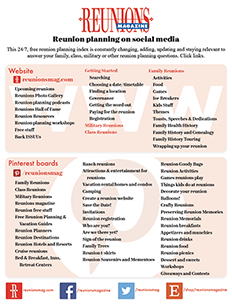 Reunions magazine has a long list of freebies for reunions. Explore our Pinterest page for thousands more ideas! Which Date Works is a simple way to help select your reunion dates. And it’s free. You list who should get the email and a calendar marked with dates you’re considering. Member responses select a date for your reunion! Everyone gets a chance to fill in dates that are good, bad and so-so, and the winning date is picked democratically. No registration is required. Where, oh where? Will your reunion be? Start your accommodation search at Reunionsmag.Hotelplanner.com to see all your possibilities at one time. It’s free for the looking, with many free services built in if you decide to book through the service, including a free room at participating hotels and a potential cash rebate after your reunion. A free podcast, “Hotels are looking for your reunion,” at reunionsmag.com explains this reverse auction site. Contact the Convention and Visitors Bureau (CVB) at your destination. They contact their members on your behalf for hotel bids, special offers and deals for your group. Many also provide promotion bags, maps, brochures and souvenir tchotchkes. Almost every place has an off-season that is less pricey. Even a summer reunion can find off-season options. Ski areas are off-season during summer, and beach resorts’ off-peak seasons vary by region. At the start of summer, tropical resorts in destinations such as Puerto Rico and Hawaii have very pleasant weather and may be off-season. Check for the best rates.